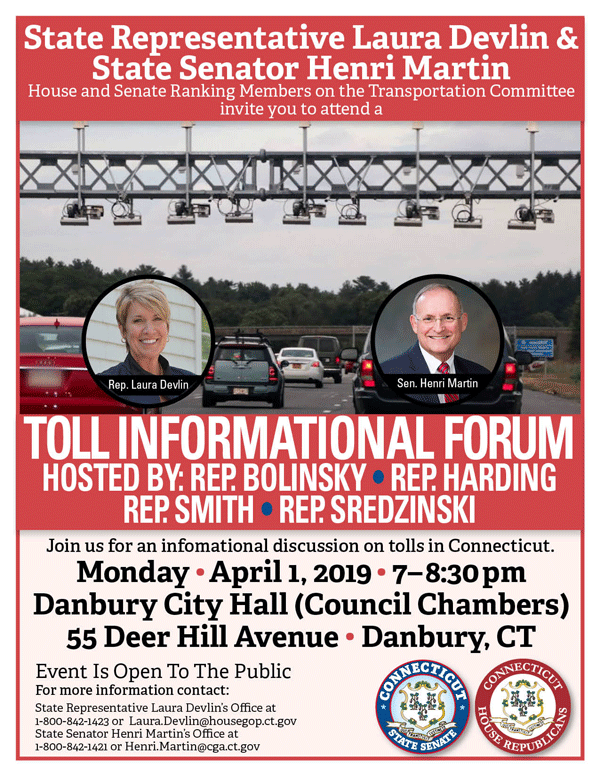 I wanted you to be aware and spread the word about a regional forum I set up in Danbury, to flush out details and learn about tolls on Monday, April 1, 2019 at Danbury City Hall beginning at 7:00 p.m. I will be hosting the forum, along with Reps. Sredzinski, Harding, Smith and others. The presenters will be the Republican Ranking Members of the legislature’s Transportation Committee, State Sen. Henri Martin and State Rep. Laura Devlin. The Transportation Committee and we legislators have already heard from thousands of people speaking their minds on toll proposals. People from all over the state, including many from Newtown, testified. Regardless of how you feel, tolling is among the biggest issues being debated on the streets and at the Capitol. This forum will provide factual information and allow us to gather with neighboring communities to discuss tolling before the state moves to implementation, whether by vote or by order. If you have any questions about tolls, or have any questions regarding the informational forum, please do not hesitate to contact me.